1st & 2nd graders at Wilson Elementary honored and entertained the Veterans of all branches of the service Tuesday morning. Students from the Middle School and Herald Elementay braved the cold to support the Veterans at their annual Downtown parade. Many of the Herald Elementary students had individual American Flags as they greeted Veterans on the east end of the parade route Tuesday. The Collinsville HS Band (which has honored Veterans this marching season with their "Rememberance" program) marched the Veterans from 14th Street to the American Legion Building at 9th and Main. The CCC Band then played a few more patriotic songs before shaking the hand and thanking each Veteran in the parade. 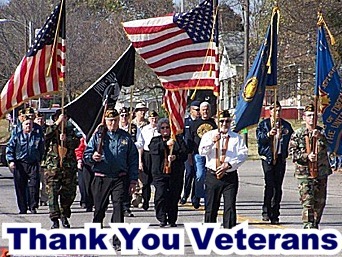 The Collinsville Middle School students fed the Veterans a turkey dinner after the parade.